This dynamic warm-up is meant to be performed before each training session and game. It should be introduced in the pre-season period and maintained throughout the season. All sections of the warm-up should be completed in order with the exception of the strengthening component, which should not be performed prior to games. Two lines of cones should be lined up 5 yards away from each other, with 5 yards separating each cone. Players should queue in two lines, one behind each set of cones. Players should stay even with the player in the line across from them throughout the warm-up. On the way down the line of cones, players should stay to the inside, and as they make their return, should stay on the outside of the cones. The first player in each line will begin by jogging down along the inside of the cones. The next player in line should begin when the player in front of them reaches the next cone. When players get to the end of the cones, they will back pedal back to the starting position. They will then jog down again, but at the halfway point they will transition into a back pedal. When they reach the end, they will begin by back pedaling and at the halfway point they will turn and jog forward the rest of the way back. The next movement is a side shuffle with a change of direction every 2-3 steps, which will be performed both down to the end of the cones, and back to the starting cone. 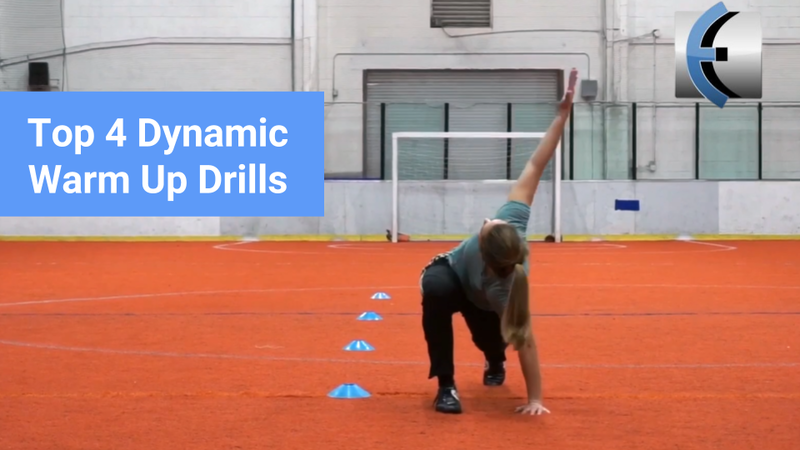 These previous three exercises will help players prepare for transitory movements that they will frequently need to perform during their sport. Players will begin the next movement by facing their partner across from them and performing a carioca with a knee drive down to the end and back again, facing the same direction. Finally, players will perform a low skip down to the end, and a high skip aiming for power on the way back. Descriptions of the different movements are below. Jog to Back Pedal - At the halfway point, players should perform a 180 degree turn from a forward jog into a back pedal. They should continue to travel in as straight a path as possible without deviating too far in either direction. It takes a fair amount of neuromuscular control and proprioceptive awareness to be able to perform this efficiently, so younger players may have a difficult time at first. Back Pedal to Jog - On the return to the starting cone, players will begin by back pedaling and, at the halfway point, will transition into a forward jog. This one is challenging to players because it forces them to turn into an area in which they have no visual reference. Side Shuffle with Turns - Throughout this movement, players should keep their knees bent, toes pointed in the same direction the player is facing (not the direction in which they are moving), and maintain a slight forward trunk lean. They should not click their heels together or cross their feet over each other. Carioca with Knee Drive - This is similar to the basic carioca that most players and coaches are familiar with, but it adds more of a power producing component and is a precursor to fast pace change of direction training. As the athlete brings their back leg forward across the front leg, they should drive the knee up and across their bodies. This is meant to train a quick hip drive to change direction and accelerate. Low Skip - In this movement, athletes are performing an abbreviated version of a skip. They are still bringing their knees high, but they are taking smaller steps and their bodies are staying low to the ground. There should not be much vertical excursion as they perform this movement. High Skip - In this variation of the skip, players are exploding off of one leg while driving the opposite knee into the air to get as much vertical excursion as possible. A common movement pattern seen in youth athletes is that they will drive up the arm on the same side as the knee that is driving up. For the purposes of optimizing performance through efficient movement strategies, cue athletes to drive the opposite arm and leg up at the same time. Doing so mimics walking and running patterns. One reasonable exception to this would be when training basketball players who need to be able to produce power while driving up the arm and leg on the same side of the body as they go up for a layup. In this component of the dynamic warm-up, players begin at the first cone, perform the stretches down to the last cone, and then jog back to the beginning. Holding long, static stretches can potentially hinder performance, so players should only hold these stretches for 3-5 seconds before moving on to the other side. The stretches described below target some of the main muscle groups that are used in soccer including the quads, hamstrings, calves, hip muscles, and groin. Make sure athletes are feeling the stretch where they are meant to be feeling it. Below are some modifications players can make if they are not feeling the stretch properly. Figure 4 Stretch - Players will cross one ankle over the opposite knee, and then sit their hips down and back as though they are going to sit in a chair. They should feel a stretch in the back of their hip. If they do not feel a stretch, have them either sit down lower into the stretch, or they can grab hold of the leg they are stretching from the shin, and pull the leg up towards their chest, keeping their shin parallel to the ground. Airplane Stretch - This movement not only provides a stretch to the calf and hamstring, but also helps practice single leg balance. Players will begin by standing on one leg and bringing the other leg straight back behind them as they hinge forward from the hips. Both hip bones should remain facing the ground and players should not rotate at the hips or trunk. The players’ elevated leg should be in as straight a line as possible with their back as they slowly lower down, and arms out to the side to form an airplane shape. Triple Threat Lunge - This is also commonly referred to as “World’s Greatest Stretch”, and for good reason. It helps to stretch the hamstrings, hip flexors, and calves, all of which are common areas of sensations of stiffness or tightness in soccer players. The players begin by taking a large step forward with the left leg, going down into a low lunge position with the left elbow inside the left knee and the right leg as straight as possible. Keeping the back knee straight will provide a good hip flexor stretch. The player will then rotate to the left, reaching the left arm up towards the sky, and then rotate back to neutral and place the left hand along the outside of the left foot. The final step is to shift the hips backwards and straighten the front knee while attempting to keep the hands on the floor. Once the knee is straight, pull the toes up off the floor for more of a calf stretch. Repeat on the other side. Inch Worms - To begin inch worms, players will reach down to the floor and place both hands on the ground (it is ok if they have to bend their knees). From there, they will walk their hands forward until they are in a plank position. Next, they are to take small steps forward towards their hands, driving the heels down toward the ground each step of the way. They can also try to angle their feet in slightly as they walk their feet towards their hands. Lateral Lunges - In this dynamic stretch, players will face sideways, take a step out with their lead foot, bend that knee, and shift their body weight towards that side in order to feel a stretch in the opposite groin area. After holding for 3-5 seconds, they will stand back upright and perform a small hop off the front leg to pivot and turn to face the opposite direction and perform on the other leg. In this portion of the dynamic warm-up, players will begin by bounding from the start cone to the end, jogging back to start, performing broad jumps down to the end cone, jogging back to start, and then performing single leg hop and hold halfway down on one leg, and the rest of the way with the other leg. Once they have reached the end cone after their last single leg hop, the first player in each line will jog back to the starting cone, and the players behind her will line up along the cones facing the other line of players. From there, players will perform the single leg lateral hops, square rotational hops, and split stance hops. For all of these exercises, athletes should be trying to keep their knees over their ankles and not extending beyond their toes, get >30 degrees of knee flexion upon landing, and sitting their hips down and back with a slight forward trunk lean. It is helpful to tell players that they should not hear themselves or their teammates landing in order to improve their ability to absorb load and force. Bounding - Begin by standing on the left foot, hopping forward and diagonally to the right, and landing on the right foot. Hold the landing for 3 seconds and then hop from the right foot, forward and diagonally to the left, and land on the left foot. Continue this process down to the end of the cones. When performing this exercise, players should make initial contact of the ground with the ball of the foot, then immediately drop the heel down, bend the knee, and sit the hips back with a slight forward trunk lean. Broad Jumps - Players begin with feet about hip width apart, sit back into a squat, and then jump forward to land on both feet and sink down into a squat again. Players should try to land with both feet about hip width apart and facing forward, initial contact is made with the balls of the feet first and then immediately drop the heels down and sit back into a squat. Single Leg Hop and Hold - Here, athletes will hop forward on one leg, hold the landing for 3 seconds, and then hop forward again on the same foot. At the halfway point down the line of cones, athletes will switch to the other leg. If an athlete is having difficulty performing this movement, tell them to take smaller jumps and focus on the quality of their landing as opposed to the distance they jump. If they need to regress the single leg aspect, they can begin by jumping off one leg and landing on both, then jumping off both legs and landing on one, and then they can go back to single leg hops. Single Leg Lateral Hops - At this point, players should be lined up facing the line across from them. They will stand on one leg, hop to the side, hold the landing, then hop back to the starting position and landing on the same leg. They should repeat this 5 times on each leg. If this is too difficult, players can perform skater hops instead in which they will begin on the left leg, hop to their right and land on the right leg, hold the landing for a second, and then hop from the right leg to the left and land on the left leg. Square Rotational Hops - Similar to the Broad Jumps, players will begin with both feet on the ground about hip width apart. They will then sit down into a squat, jump straight up into the air, turn 90 degrees to the right, and land facing what was previously their right side. This will be repeated 3 more times until the player is facing the way they started. They will then repeat this process going to the left. Split Stance Hops - Players will begin in a split stance position (step one foot forward in front of the other), and sink down into a split squat. From there, the athlete will drive up into the air, bringing the back leg to the front and the front leg to the back, and then sinking back down into that split squat position. The opposite arm should drive up with the knee as it comes forward to mimic running. Players should be able to stay in one spot as they perform these jumps. Perform 5 repetitions on each side (10 total jumps). The strengthening component of the dynamic warm-up should be performed prior to training sessions, but not games. This is to prevent muscle fatigue prior to a game. As players demonstrate mastery of each exercise at the prescribed repetitions, increase the amount that they are performing. For example, if they are able to perform 10 squat to heel raises without their mechanics breaking down (often a sign of fatigue) for two training sessions in a row, then increase to 12 repetitions the following session. For this part of the dynamic warm-up, players should still be positioned in the same place they were for the end of the plyometric training portion. Squat to Heel Raise - Players will begin with feet about hip width apart, facing the line of players across from them. They will sit down into a squat, stand back up, and then go up onto their toes to perform a heel raise. Begin with 8-10 repetitions and work up to 15-20 repetitions as the season goes on and the players’ mastery of the movement improves. Split Squat Isometric Holds - Set up is the same as it was for the Split Stance Hops in the Plyometrics portion. One foot will step slightly ahead of the other and sink down into a split squat. The back knee should be hovering just above the ground. Players should hold this position for 20 seconds to begin with and progress up to 60 second holds on each side. Bridges (Progression to Single Leg Bridges) - Players will now lay on their back with their knees bent and feet flat on the ground. They will squeeze their glute muscles and lift their hips off the ground, keeping their backs and the backs of their thighs in as straight a line as possible. They will hold for a second at the top, then slowly lower back down. Their hips should remain level throughout the movement. Once they are able to perform 20 repetitions, they can be progressed to Single Leg Bridges. Make sure they are not swinging the other leg and utilizing momentum to lift their hips off the ground. The leg that is not working should be straight up in the air, with the soles of the feet pointing towards the sky. Hamstring Walkouts - Players start in a bridge position and then take little steps out until the legs are completely straight, and then bring the legs right back up to the starting position. Players should perform 6 total walkouts, and work their way up to 12. Plank with Hip Extension - From a forearm plank position with the back of the body in as straight a line as possible, and without over extending or arching at the low back, players will kick one leg straight up off the floor a few inches, and then return it to the floor and repeat on the other side. Their hip bones should stay facing the floor throughout the exercise. Have them perform 5 on each side to begin with and work their way up to 10 on each side. Plank with Rotating Hip Drops - From a forearm plank position, players will rotate at the trunk to bring their right hip to touch the ground, go back to the middle position and pause, and then rotate to touch the left hip to the ground. Players should always pause for a second in the middle before rotating to the other side. Movements should be slow and controlled. Begin by performing 5 on each side and gradually work up to 10 on each side. Plank with Hip Abduction - From that same forearm plank position, players will bring one leg out to the side, return it to the middle, and then repeat on the other side. The leg that is moving should remain about an inch or two off the ground and the trunk should not rotate. Side Plank Thrusters - From a forearm side plank position, drop the hips to the floor, and then push them into the air as high as possible. Perform 5 times on one side, then switch to the other side. Eventually work up to performing 10 repetitions on each side. The body should be in a relatively straight line from the shoulder to the hip to the ankle. Side Plank with Hip Abduction - From a forearm side plank position, slowly lift the top leg off the bottom leg and then lower it back down again. Begin with 5 repetitions on each side and then work your way up to 10 on each side. The toes of the working leg should face straight ahead and not rotate up to the sky.